A Florida neighborhood got quite the surprise as a large alligator took a stroll by several homes after storms came through the area. 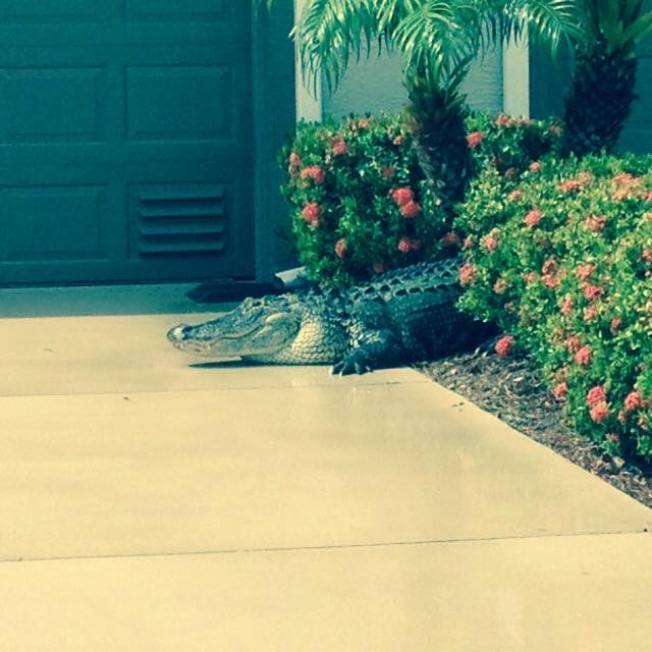 Police in Palmetto, a city located just south of Tampa, posted several photos of the alligator on their Facebook page, with the caption, "A resident in the Terra Ceia Golf and Country Club had an unexpected visitor after today's storms." A follower of the police department's facebook page posted that residents nicknamed the gator "Stumpy" for his shortened tail. Several other residents commented, saying Stumpy has lived in the community's pond for a long time and has never been a nuisance. Palmetto Police said the alligator walked around and then went back into the housing community's pond. "Some nearby residents came out and said that this guy has lived in the pond on the golf course for years and has never posed a threat," the police department posted on Facebook. "He was not aggressive but couldn't have cared less about us standing in his way. Even though the trapper enroute wanted us to keep him from going into the pond, we let him go on his way. He probably lived here long before the golf course and housing community were built. An old native Floridian."